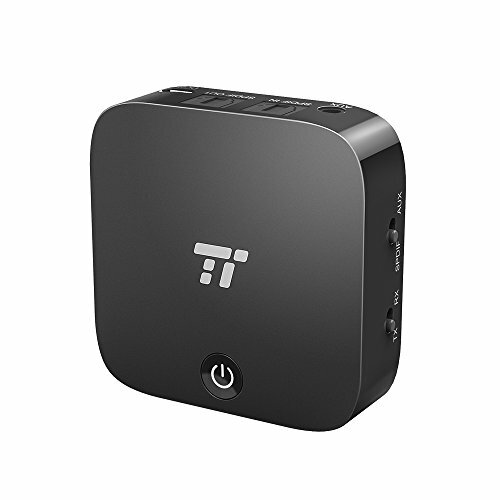 Whether you want to stream music to wireless headphones / speakers or make your old sound system wireless capable, the TaoTronics 2-in-1 Wireless Transmitter and Receiver is your perfect choice. Packed the latest Bluetooth 4.1 technology, dual connector, and many handy features this portable high-definition adapter will make your best music even better. While many adapters on the market only support 3.5mm headphone jack or RCA connection, the TaoTronics adapter edge ahead by also supporting TOSLINK optical cable input or output so your TV with optical sound output can feed the adapter, and your audio system can also become wireless with an optical connection. Streaming indefinitely by connecting with a charger or get up to 15 hours of playtime without charging thanks to the latest Bluetooth 4.1 and large internal battery. Share great music with your partner by simultaneously pair and stream to two headphones or speakers at the same time. The adapter will even automatically re-pair with existing devices. TRANSMITTER + RECIEVER: One portable adapter to use as either transmitter or receiver, powered by the latest Bluetooth 4.2, can pair with two headphones / speakers at once. LOW DELAY: aptX Low Latency technology eliminate Bluetooth audio delay, so you can watch TV / Movie / Video and listen to high-clarity sound in perfect synchronization. Note: aptX Low Latency ONLY supports TX mode.